THIS DAY IN RMR HISTORY: “Canadian Associated Cables), London, Feb 28. On Monday week last we cabled that a certain brigade of the Canadian force had been moved towards the trenches on the previous Saturday (fortnight yesterday), and that Capt. Harry Coghill of Stratford, Ont., was in hospital owing to exposure. Since then the Canadians have been doing duty for forty-eight hours in the trenches, and relieved by others of the contingent. At the present time the only reliable news here is that one wounded man has been admitted into the hospital in France, and another man was returned to England, but it is not known yet whether he is sick or wounded. 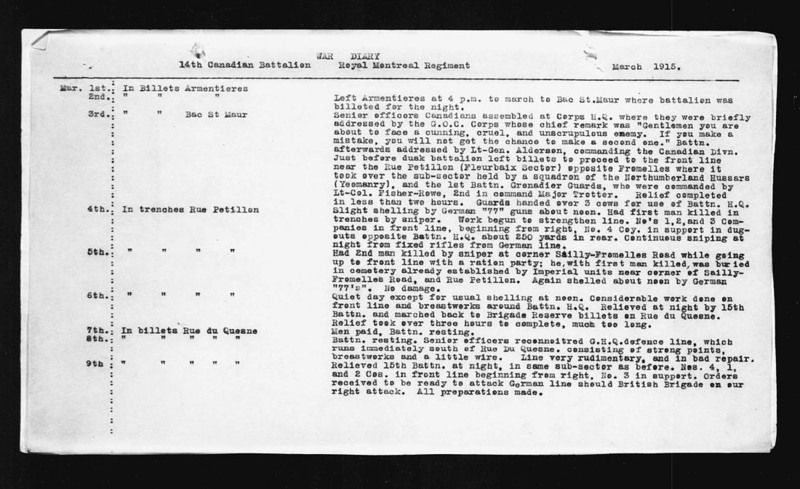 The greater part of the Canadian forces were a long time in France before they came within hearing of hostilities. The artillery, mechanical transport, divisional supply column, ammunition park, and Army Service Corps stayed at the base, along with the field ambulance and army medical units, during this time. A Great Reception: The waiting men were delighted with the reception accorded them by the poor people of the district, with whose possessions war had played sad havoc. Presents of fruit and wine were made to them. Canadians, in all cases, insisted on paying for these gifts, but the peasants were most unwilling to receive any acknowledgement, although one of the prettiest incidents was the manner in which little children surrounded Canadian soldiers, pleading “Souvenir, souvenir.” In response many of those appealed to plucked off their maple leaf badges and handed them to importunate ones.